I really want to thanks Sim2Cri for the honored award they've given this thread. If you're interested in seeing the award and other great creations Finds Section that also received awards. 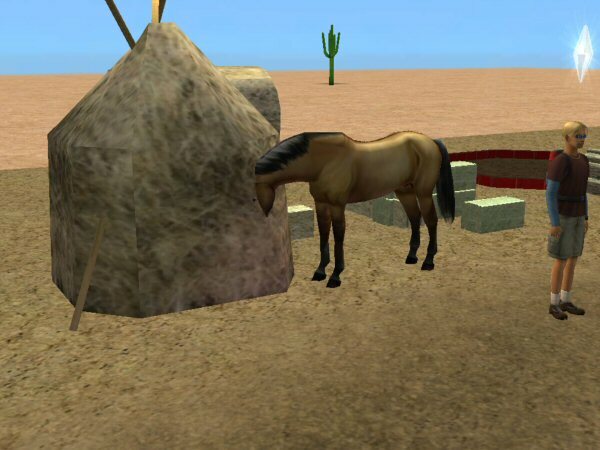 Updated Jan 4, 2008 - I recoded the riding portion and created new animations for the horse. I've also added a graze option. It is still not perfect but I do think most of you will like it better. Sims no longer disappear when you cancel the action for either riding option. If you use boolprop testingcheatsenabled true and the Sims exits autonomously it will generate an error of undefined transition as do all of my ride able items. This is something I am just not able to figure out. If you don't use the testingcheat you won't notice any problems. The horse legs move more often and the start is smoother. Please note if you use the ride options it is best to direct the sims to do something else rather than cancel the option. I am studying more about how the animations work and hope to resolve this issue but it may take me awhile. Canceling the animations causes an error so if you direct them to do something else it allow the animation to complete. Please understand I'm not wonder woman and I only share what I'm capable of doing. I do try to learn more everyday and update my items as often as I possibly can. Please be sure to check this thread or my journal for possible updates. Dragon Slave has created a new bridle and saddle but I have not figured out how to add it as there is already 2 subsets and my understanding is this is the limit. I'm sure if I had the tools that EA employees have it be a lot easier to do the animations. MilkShape is not a top of the line animation program, and is very difficult to use as some of you may already know. At this time it is the only option I have available. We wouldn't even have that if it weren't Wes_h and his plugins. This was originally requested by Dragon Slave, I’ve since received many requests for a ride able horse. I tried to get the gaits to look as smooth as possible but they are not perfect. I’m still very new to creating animation for object and Sims so please take that into consideration. I do plan to do more with this horse but so many are asking for it I decided to make it available for testing. 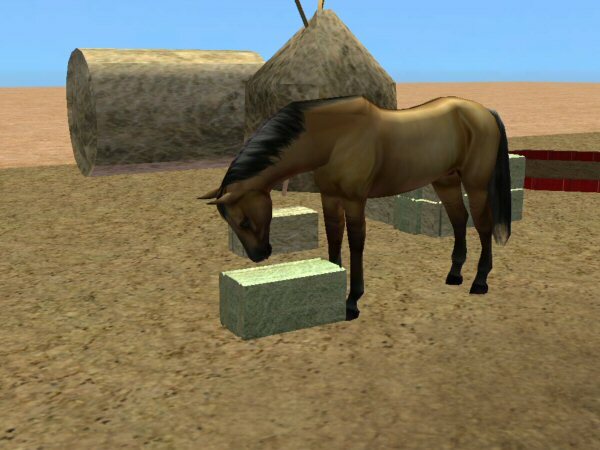 Notice: You must download Dragon Slaves Horse to use this as the textures are pulled from her horse. The ride able option should work with all EP’s or any combination. The ride able options are non autonomous, sounds and other animations are autonomous. Sims will sometimes sit sidesaddle or backwards I find if you face the head towards the mailbox the Sims will usually get on the proper direction. I have an option to ride the horse which is the pace gait and an option to ride in a trot gait. I updated it today because I was able to reduce the poly count by about 90% and I added a straw recolor. Sims gain fitness, body skill and fun when riding. The other options give fun to any age except infants. It is found under Knowledge/Exercise for $1200. The ride able portion is controlled by an NPC controller. The controller ages after time and may change the height of the item, if this happens you may re-download the item or save a copy of the controller in another area of your computer. 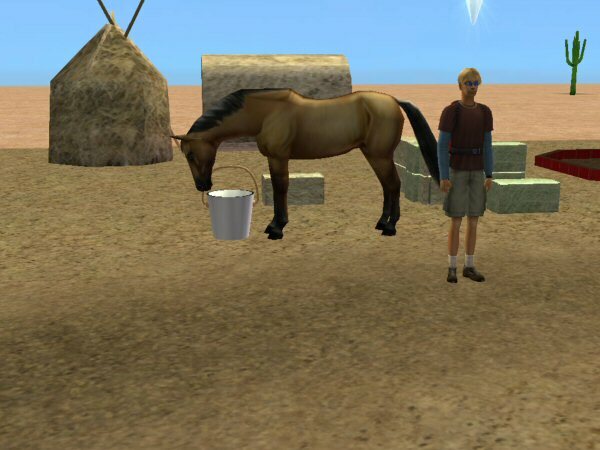 If the Sims is riding the horse when you exit the lot the horse will disappear. The game automatically removes any NPC’s that are not household members, and are in the selected mode. I try to update my items as I learn more so be sure to check back once in awhile. If you happen to look at the file I did try to create a groom option but I was unable to get the code to place the brush in the Sims hand. If anyone knows of a tutorial on how to do this please let me know. This one took me several weeks to get working such as it is and was actually the first ride able animal I worked on. I sure hope some of you enjoy it. Please read the full thread. If your horses are blue you didn't read the instructions. You must download Dragon_Slaves textures! Drinking Fountain/Water Cooler - Custom Object, animations, and coding.